ARLINGTON, Va., April 9, 2012 — Navy unmanned aircraft will be able to distinguish small pirate boats in congested coastal waters when a US Office of Naval Research (ONR)-funded sensor starts airborne tests this summer, officials announced. 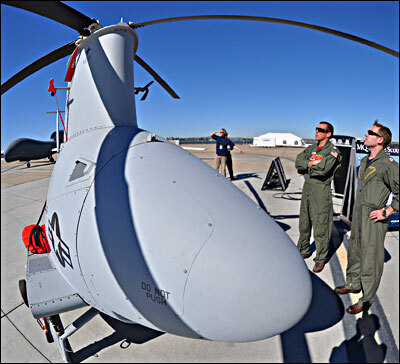 The Multi-Mode Sensor Seeker (MMSS), which will be placed on the Fire Scout robotic helicopter, mixes high-definition cameras with mid-wave infrared sensors and laser detection and ranging (ladar) technology. The sensor prototype carries advanced automatic target recognition software that will allow Fire Scout to autonomously identify small boats on the water, reducing the workload of sailors operating it from control stations aboard Navy ships. The Navy-developed target recognition algorithm on Fire Scout exploits 3-D data collected by the ladar, using a long-range, high-resolution, eye-safe laser. The software compares the 3-D imagery to vessel templates or schematics stored in the system’s memory. The Navy successfully tested the algorithm in shore-based systems against vessels at sea. The software is being integrated into a BRITE Star II turret by a team for airborne testing abroad a manned test helicopter. The flight assessment will be conducted against groups of approximately seven small boats in a military sea range off the California coast later this summer.